One of the things we have become involved in as a church is helping two asylum seekers, who were brought to us by friends in other churches. They are both Africans, and both from Congo, though one is from the Republic of Congo (Brazzaville) and the other from the Democratic Republic of Congo (Kinshasa), and they came to us because we have former Congo missionaries among our members, who speak both French and Lingala. Lauréat Nsadi, from Brazzaville, is an educated young man, with a Masters’ degree from France, who was a close associate of the former Prime Minister, Bernard Kolelas, overthrown in a military coup in 1997. There was 4 months of Civil War, and Lauréat and his wife eventually managed to escape across the river to the Democratic Republic of Congo (Kinshasa). In the DRC they lived in various refugee camps organised by the UNHCR, where Lauréat maintained some sort of political activity and was under threat. In April 2002 and with the assistance of the Provincial Governor, the UNHCR put him on a ship bound for Belgium, though his family were not able to go with him. The ship was diverted to Saõ Paulo, in Brazil, where he was disembarked by the Captain, and taken by the Brazilian authorities for questioning. He stayed in Brazil for 20 months, and was granted refugee status by the authorities. However, he was constantly harassed by the police, and took over a year to get a work permit and passport, which was only valid for two months. Permission to bring his family was constantly refused. Realising he could never settle in Brazil, his friends put him on a plane for England, armed with a French passport obtained in his name. He arrived at Heathrow on 9th April 2004, and asked for asylum. His initial request was refused, and he was sent to Leicester pending an appeal, being moved to Nottingham in September 2004, when he was brought to our church. The whole church became really involved when he was arrested for deportation in August 2005, and he was visited almost every day in the detention centre in Lindholme, near Doncaster. He was taken to Gatwick, then reprieved at the last minute, and sent to Dover detention centre. Finally, he was released unexpectedly on 12th October 2005 and welcomed home by a small reception committee on the platform of Nottingham Station! Since then, he has lived with two of our church members, and been supported financially by the church. He in turn has joined the church, and played a full part in our activities. His legal quest to remain in the UK continues, with help from us, our local MP and many other well-wishers, and we are determined to support him for as long as it takes. The Home Office agreed to reconsider his case in July 2006, and re-interviewed him in January 2007, since when he has heard nothing. We long to see him settled, so that his wife and children can leave the refugee camp after 10 years, and join him. The second Asylum seeker, Jean Mola, arrived from Congo Kinshasa in October 2006, and his story has a happier outcome. He is blind, has trained as a pastor, and was founder and director of a school for the blind in Kinshasa. His campaigning activities on behalf of the disabled in Kinshasa brought him to the attention of the authorities, and when he refused to join the party of President Kabila and to mobilise the handicapped in support of Kabila’s campaign for re-election, he was arrested and tortured. He fled across the river to Brazzaville, where his wife joined him, leaving their son with her parents. Because of his links with the UK through the Baptist Missionary Society, he decided to come to England, as he could easily be hunted down in Brazzaville. 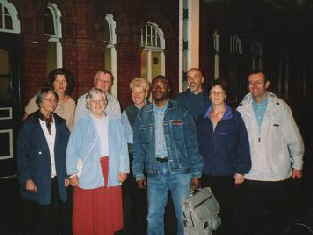 He had already been here before, to the meeting of the Baptist World Alliance in 2005 (ironically, he visited Laureat while the latter was in detention in Lindholme). While he was in Nottingham, we helped him with practical support, such as transport to church and to the Post Office to withdraw his NASS support money. We brought him to Tommy’s on a regular basis, and went with him to the doctors, etc., to provide transport and translation. Luckily, Mola has now been granted permission to remain in the UK, and has moved down to London where he has many friends. We pray for the same outcome for Lauréat, and soon!